Renewable energy is that form of energy which is generated from natural resources like the sunlight, wind, tides, rain, geothermal heat, etc. The term renewable is used since they are naturally replenished, not requiring human participation or contribution. Around 18% to 20% of global energy consumption in 2006 came from renewable sources of which 13% came from conventional biomass like wood-burning while Hydroelectricity was rated 3%. The rest comprised of solar hot water/ heating, wind power, solar power, geothermal energy and ocean energy. Global warming reaching unbelievable heights in the recent past, coupled with fantastically high oil prices ($4.00 extra for a gallon of car fuel in the US) have forced many governmental authorities both in Europe and in the United States to gear up support for creating renewable energy in many forms. In March, 2007, European Union leaders reached an Agreement in principle that at least 20% of their country’s energy should be generated from renewable fuels by 2020. This was primarily done to diminish carbon dioxide emissions mostly responsible for global warming that is already evident by thawing out of the Arctic ice. As a result of such authoritative support and spontaneous fervor, investment capital flowing into renewable energy rose from $80 billion in 2005 to a record $100 billion by the very next year. Out of most forms of renewable energies known to men, two very significant forms of energy that are widely used these days comprise wind energy and solar energy, both of which are converted to electrical energy by comparatively simpler means. While wind power utilization is currently growing at the rate 30% on an annual basis with globally installed capacity going over 100 GW that includes several European countries as well as the United States, the manufacturing yield of solar (Photovoltaic) industry went up to more than 2,000 MW in 2006. Photovoltaic or Solar Power stations are fairly popular in Germany while many such stations operate in the USA and Spain. Of course, the world’s largest geothermal power installation is located in California (The Geysers) with a rated capacity of 750 MW. Brazil, however, has gone one step ahead of others in producing Ethanol Fuel from sugar cane which caters for 18% of the country’s automotive fuel needs. US President Barrack Obama is confident of controlling greenhouse gas emissions that are principally responsible for global worming and is believed to be soon enacting laws in favor of large scale use of renewable energy. Solar panels for your home are already available and it is assumed that the popularity of home solar power will keep rising in the years to come. Cheap solar panels are available and they can be installed quite easily making it convenient. Plus given solar power’s ecological advantages and also due to the fact that solar power reduces the electricity bills drastically, it definitely seems the way to go. But to install residential solar panels, you will need to know where to set it up and how to do it, where to get the parts from affordably, how to wire the system and also the safety precautions. 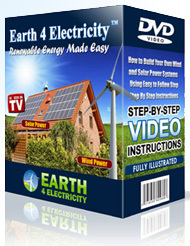 What you need is a guide that will inform you about all this and then you can benefit from the many advantages of solar power.